This was an interesting one: as I drove up to park, I came across a car in a ditch, with a police car directing drivers around it. By the time the race started, it became clear that the removal of the car, which had been driven off the road early in the morning by a teenage driver who thankfully was uninjured, would alter the race course, so we had to do some extra loops and avoid the area while the crane dragged it out. 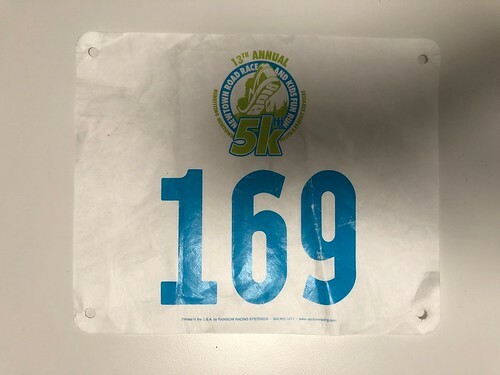 On another note, it was bound to happen eventually: I finally got bib #169. There weren’t any trumpets to fanfare the moment, but it was nice. The start was located at a beautiful park, with a nice playground, though the race was too early in the day to bring the kids this time. Also, the ice cream place we’d wanted to try wouldn’t be open by the time the race was done, so another day, perhaps. The weather was cooperative: it was the first cool day in awhile after a week of unseasonably hot days. The race was good, and I felt like I was pushing it the whole time. With a big pack ahead of me, I reeled a number of people in, and didn’t get passed by too many, but still, there were a lot of fast people out there today. I came in 30th overall, naturally fourth in my age group.